St Michael's went to Meadow Park on Saturday hoping to continue their recent run of success against a Celtic side which was playing its last match before leaving for a tour of Canada. 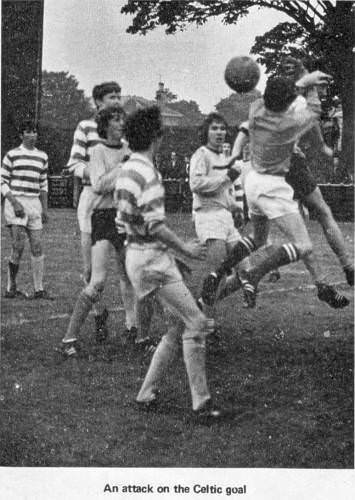 The first chance came after only one minute's play when McLachlan sent a low ball across the Celtic goalmouth to Smyth but he was slow to react and the chance was missed. Early play swung from end to end but St Michael's looked more likely to score. Most of their attacks stemmed from McLachlan who was giving the Celtic defence a great deal of trouble. Celtic's first chance came after six minutes when Long brought off a fine save from Haggarty after he had beaten two defenders. St Michael's opened the scoring after 15 minutes when a good move engineered by Scullion in mid-field let Scott through to score from close in. Celtic pressed hard for the equaliser, but good defensive work by Dickson and Morris kept them out. At the other end Breslin and Smyth came close to scoring but Celtic keeper Conlin was in great form. Celtic mounted an attack on the left wing and a good cross from Morton was put past for a corner by Hamilton. Sermanni took the kick and crossed to Mackie who headed over the bar with Long caught out of his goal. The Celtic equaliser came after 20 minutes. The move started in midfield when Stein, son of manager Jock Stein, sent through a long pass to Ferris who side-stepped O'Neil before crashing a great shot into the roof of the net. The St Michael's forwards were eager for another goal but were being played off-side frequently by a very competent defence. Ten minutes before the interval Scott went down heavily after a clash with a Celtic defender and was carried off and D'Allasandra substituted. Just on half-time Breslin scored a great solo goal for St Michael's. He collected the ball just outside the penalty area, waltzed his way past three bewildered Celtic defenders and calmly placed the ball out of the keeper's reach and into the net. In the second half the crowd were entertained by Celtic's pint-sized right-half Ferris, who tortured and tormented the St Michael's defence with a great display of ball juggling, dribbling and body swerves which took him past their defence almost at will. In the 60th minute McLachlan came close for St Michael's but his shot went just over the bar. St Michael's substituted Puff for Smyth and Celtic brought on Timmons for Morton. The St Michael's defence was under great pressure and Long brought off a one-handed save from Ferris after a goalmouth scramble. Then a Timmons header hit the bar and went over. D'Allasandra missed a great chance for St Michael's when, with only the keeper to beat, he mishit his shot and it landed safely in the arms of Conlin. Celtic went all out for a goal and nearly scored when Haggarty had a good shot blocked by Dickson when Long was out of position. Murphy substituted for Ferris. Celtic got their much deserved equaliser with 10 minutes to go when Haggarty scored from 15 yards after a good run by Crossy. A very good game and a fair result. Best for St Michael's were Breslin, Scullion and Hamilton and for Celtic Ferris, Sermanni and Stein. St Michael's : Long; O'Neil and Dickson; Morris, Hamilton and Scullion; McLachlan, Scott, Breslin, Smyth and Newman. Substitutes, D'Allasandra and Puff. Celtic : Conlin; Welch and Stein;Dickson, Crossy and Ferris; Smith, Sermanni, Haggarty, Morton and Mackie. Substitutes, Timmons and Murphy.